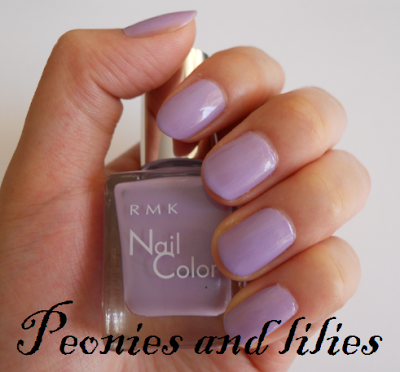 A beautiful cool toned lilac colour with a hint of shimmer that dries to a glossy finish. Two coats were required for an opaque even colour, but this really is the perfect nail varnish for Spring. Not only is it a gorgeous pastel colour, it's also infused with a delicate silver shimmer, which glistens beautifully in the sunlight! Have you tried any RMK make up? What's your nail varnish of choice for Spring? I once bought a huge bunch of RMK products: primer, foundation, powder and lipstick. The quality of everything is lovely but the foundation broke me out. :( I was so sad because I loved the formula. I wasn't so keen on the lipstick at first, bit drying, but once I put lip balm on first, it was fine. I think my favourite brand of make-up is Paul & Joe. Eyeshadows are wonderful and their lipsticks...are the best ever!!! So moisturising that I don't even need to put lip balm on first and it doesn't sit in the cracks. It's the one brand that I've loved everything I've tried. You can find them at Fenwicks on New Bond Street. Bee - It's so annoying when a foundation breaks you out! I have so much affection for this shade, and such a difficult time making it work with my skin tone. It looks so lovely on yours! I've never tried RMK, but saw Lisa Eldridge sporting the White Blue colour in a recent video. I think the colours are great for spring!